Let me start by saying that this article is probably a bad idea. The teenage experience is diverse enough that putting “The” in front is more outright lie than bending of the truth. I speak only from my personal experience of having known and still knowing a great many teenagers, towards a group that, if not united, I understand to at least be held together in vague parts by experiences of a similar nature: teens. As teens we are told that our time as such is finite. Both our troubles and our dreams will soon pass together with our adolescence. Whether this commentary proves true or not, it is usually ignored; we spend many years trapped in our own heads, unwilling or unable to imagine a life after high school. Just because our problems are fleeting does not mean that they are not real, and just because our perspective is limited does not mean it can rightfully be ignored. In comes Monogatari, crashing into our lives. Anime already looked different to most other things we watched, but from its first episode, Monogatari sets itself apart with sudden, urgent shifts in animation style, subliminal flashes of text, and a never-ending stream of rapid-fire dialogue, to name a few of its most salient features. More things the first two episodes feature: Tsundere service in the form of Hitagi Senjyogahara, fan service shots of said tsundere, short but explosive glimpses of fights against the supernatural, and the fictional groundwork for a world wherein many such fights can still happen. It's all very enticing yet familiar stuff and the spoonful of capital “S” Style that envelopes the whole thing, while pushing some away, is bound to pull more than a few in. What makes Monogatari special is the constant balancing act it performs between subverting the very things that make it attractive and endorsing them. It would be wrong to say that Monogatari tricks you into deeper meaning, because that would mean it rejected the initial assumptions about it: that it would be a bit of escapist wish-fulfilment with an especially strong sense of personality. The hero, Araragi, shows up, fights monsters, solves girls' problems, gets the girl, repeats, gets a few more girls, saves the world maybe. Bakemonogatari and Nisemonogatari, the first two seasons, play out according to this formula the most.However, for all of Araragi's self-sacrificial attempts at heroism, the story structure is constantly thwarting him from being one. From the very start Araragi's contribution to Senjyogahara's salvation - to bring her to specialist in the supernatural Meme Oshino, and to see her through her trial – is significant, but not wholly fulfilling. Araragi himself has to be saved from three out of five rescue attempts by a third party in Bakemonogatari, or he would have died uselessly. 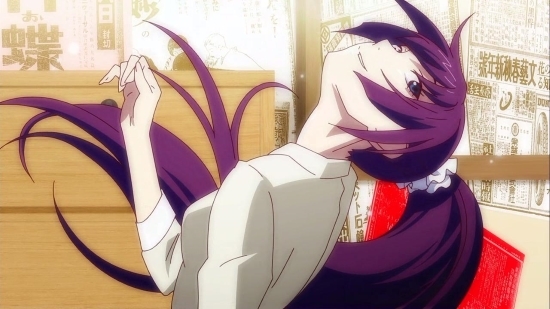 The confusingly named third season, Monogatari Second Season, goes further still by marking the total separation of Araragi and two of the original cast necessary to resolve their storylines, which it does by turning one into a poisonous presence for Araragi, and Araragi into a poisonous presence for the other. The purpose of this anti-escapist subversion, other than to show that Araragi has a deeply unhealthy and not all that helpful martyr complex, becomes fully apparent in Second Season. This is the season in which other characters start taking the protagonist role from Araragi for their own arcs. The first of these is the conclusion to one Tsubasa Hanekawa's character development and it is remarkable to learn how many of the series' quirks were to put us in Araragi's head space, rather than crucial elements of the series proper.